KANATA, ON, May 25, 2017 (Newswire.com) - HubStor Inc. today announced new WORM archiving and search capabilities for Microsoft Office 365’s unified audit log to help organizations meet their regulatory compliance requirements and bolster their litigation preparedness posture. 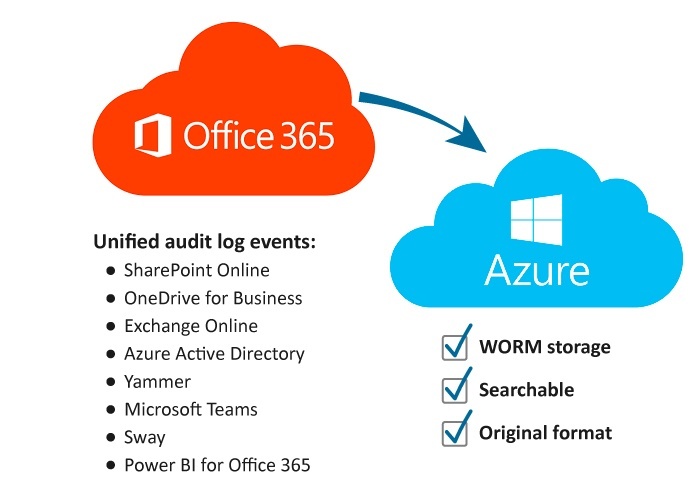 The unified audit log in Office 365 is a record of all user activity such as Azure Active Directory login events, document retrievals in SharePoint Online and OneDrive for Business, and email activity in Exchange Online. It can also be configured to record administrative actions which companies can use to help identify insider threats. Now, with HubStor’s new connector for the Microsoft Office 365 audit log, clients can automatically harvest event history data from their Office 365 tenant and have it preserved and searchable in Microsoft Azure for as long as necessary. Using HubStor’s data-aware storage architecture, all properties from the Office 365 audit log are searchable. Regardless of the search field settings, HubStor always preserves the complete and unmodified JSON for the audit event to produce an exact copy of the record as it was in Office 365. HubStor’s data governance rules engine can also consume event properties for use in data retention, full-text indexing, tagging, and WORM storage policies. HubStor supports targeted capture from the audit log for clients that only need long-term preservation of specific event types. The discovery search interface in HubStor allows privileged users to find the relevant events quickly. For example, a search may look for all the information accessed by a person of interest in a particular SharePoint document library within a date range. Event records of interest can be placed on legal hold and easily exported in JSON format. The new HubStor connector for the Office 365 audit log is available now and comes under HubStor’s consumption-based pricing model. ORGANIZATIONS CAN NOW ENHANCE THEIR LEGAL POSTURE BY PRESERVING THEIR MICROSOFT OFFICE 365 EVENT HISTORY LONG TERM IN A SEARCHABLE AND WORM-COMPLIANT MANNER IN MICROSOFT AZURE. HubStor helps organizations transform their storage, archiving, search, and data protection processes with the cloud to reduce costs and improve the security of mission-critical data assets. HubStor is Software-as-a-Service (SaaS) delivered on Microsoft Azure. Organizations use HubStor’s cloud storage solution for a broad spectrum of use cases, including searchable cloud backup and recovery, file system archiving and seamless storage tiering, evidence management, SMTP journaling for Office 365, and WORM storage in the cloud. HubStor currently serves clients, large and small, across a variety of industries in the United States, Canada, and Europe. HubStor is a CIOReview ’20 Most Promising Azure Solution Provider in 2016’ and is a member of the Microsoft Enterprise Cloud Alliance.